A great upgrade for the stock steering damper on the R1200GS water cooled, the Touratech Suspension damper features better damping characteristics and more adjustment range to fine-tune your handling. 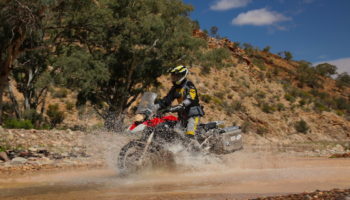 Turbulence from an oncoming semi-truck, an uneasy feeling from knobby tires on pavement, instability in sand or gravel; these are all problems that can be easily solved by adding a Touratech steering damper to your BMW R1200GS. While the R1200GS is an inherently stable motorcycle for touring, when pushed hard off-road, loaded up with luggage, or riding fast in the twisties, it can start to show signs of front-end instability. This feeling is increased even further when a knobby tire is mounted on the 19-inch front wheel. A steering damper effectively absorbs and dampens force transmitted from your front wheel to the handlebars, keeping the ride smoother and more stable. This can be any kind of force from the jolt of a big rock hit down to a slight shake or vibration from a side wind. You will immediately notice the difference the first time you ride behind a big truck on the freeway, or push the bike hard on a sandy road. The steering damper has 24 clicks of adjustment, so you can quickly dial-in your preferred damping level depending on the riding condition and terrain. Use a lighter setting for general road riding, and then increase the damping level as you transition to gravel roads, dirt roads, or sandy two-track riding. This kit from Touratech includes everything you need to install a steering damper on the front end of your R1200GS or Adventure. There is no need to buy separate dampers and mounting kits. This is designed and tuned specifically for your BMW R1200GS. The installation is a simple bolt-on process, and requires no removal of bearings, drilling, or modifying your motorcycle.